Sengetsu, which means “crescent moon,” gets its name from Sengetsu Castle, another name for Hitoyoshi Castle where the Sagara clan ruled the Hitoyoshi-Kuma region uninterrupted for 700 years. Sengetsu boasts over a century of history and tradition. We use only carefully selected, high-quality rice and river-bed water from the pure Kuma River, born of the unspoiled nature of Hitoyoshi, to create our shochus. Sengetsu Shochu is especially popular amongst the locals of Hitoyoshi, the home of Kuma Shochu. Our shochus are the standard for Kuma Shochu, with a mild flavor and a hint of umami that goes perfect both on-the-rocks or with hot water. The word sengetsu means not just “crescent moon,” but is actually the thinnest kind of crescent moon where the moon looks like a curved thread in the sky. 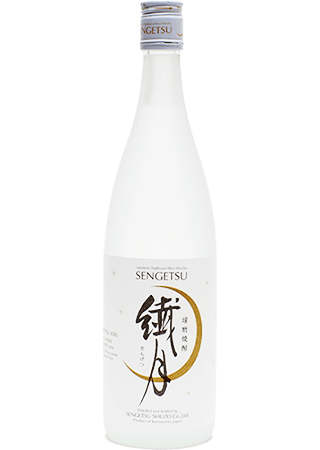 The six stars that surround the crescent moon on our label represent the six toji—master distillers—who have carefully protected the history of Sengetsu for over a century. The Kawabe River watershed is carpeted with spring-fed rice paddies that turn a beautiful golden hue in the fall season as the rice ripens for harvest. Kazuki Yoneda, a farmer who has been growing rice for 50 years and whose rice is used to make Kawabe, explains, “Quality water is key for making good, sweet rice.” The Kawabe River, which flows through the village of Itsuki before joining the Kuma River in Sagara, irrigates most of the rice paddies in the region, but Mr. Yoneda waters his paddies with even purer water, straight from a freshwater spring that pumps out four tons of water every minute at a steady 17°C, even in summer. Fresh from the spring, this water has a bracing chill on the tongue and is very delicious. Using water of such excellent quality for irrigation is precisely why Mr. Yoneda is able to grow rice of such high caliber. The Kawabe River is famed both for the quantity and the quality of water that flows through it. It is the largest tributary of the Kuma River, and flows for a length of 67 kilometers. Since 2006, for 12 years running, the Kawabe River has been named by the Ministry of Land, Infrastructure and Transport as having the most beautiful water out of all the rivers of Japan. The waters sparkle a bright emerald green hue as the light reflects off the river, but a closer look reveals a clarity that extends down to the rocky riverbed. Sweetfish, gobies, chubs, and trout populate the waters, and the air around the river twinkles with innumerable fireflies in early summer. 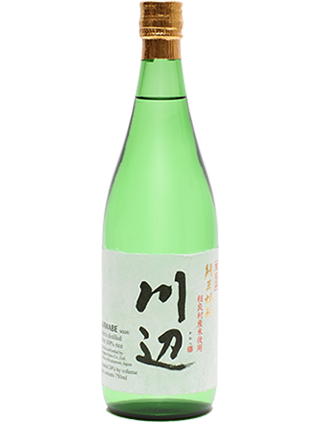 Made from such superior water and local Sagara village rice grown in the same water, it’s no surprise Kawabe was awarded the Best of Shochu award at the Los Angeles Wine & Spirits Competition in 2013, the first year an award was given in the category of shochu. We recommend savoring the delicate flavor of Kawabe while imagining summer fireflies flitting over the cool, pure waters of the Kawabe River. Starting in the 1960s, Toyoka Sosogi, the third-generation head distiller of Sengetsu, began aging our shochu in oak casks in addition to the clay pots traditionally used to age shochu. At the time, cask-aged shochu was almost unheard of. In the years since, we have acquired considerable skill at cask aging and have handed down this knowledge to each subsequent generation of distiller. Mugon has spent at least 10 long years of misty mornings in the sleepy Hitoyoshi Valley aging in oak casks. Mugon starts with our excellent rice shochu, which we then carefully age on oak according to our proprietary aging methods to best bring out the natural flavors of the wood and create a mild yet sweetly fragrant aged shochu with delicate aromas of banana and vanilla. Mugon is a true amber-hued work of art. Enjoy Mugon straight or on-the-rocks. Red shiso, also known as red perilla, is an herb that rich in vitamins and minerals. Koishiso, meaning “I think I’m falling in love,” is crafted with Kumamoto-grown red shiso specially blended with a unique formulation of Sengetsu rice shochu that best matches the flavor of the shiso to create a truly elegant liqueur. 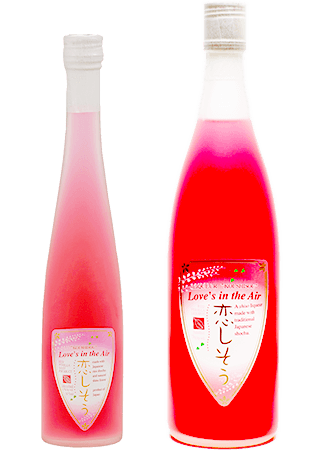 The beautiful pink color of the liqueur is extracted naturally from the shiso, allowing Koishisou to be produced with absolutely no added preservatives, colorings, or fragrances. And at a strength of 7%, it is very easy to drink. You can enjoy Koishisou chilled, with ice, with club soda, or even over vanilla ice cream. 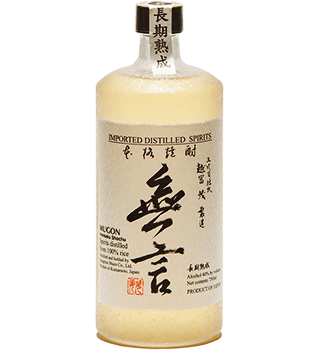 Momomo is a shochu-based liqueur made with Kumamoto-grown white peaches and a special blend of Sengetsu rice shochus. 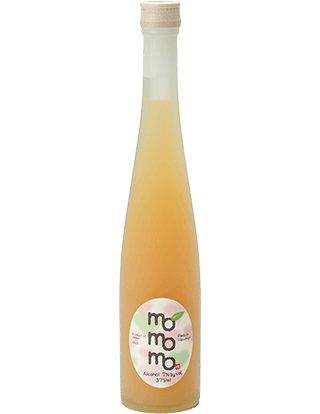 Thirty percent of Momomo is pure, juicy peach juice and pulp, creating a liqueur that tastes just like biting into a fresh peach. Momomo is also completely free of any added preservatives, fragrances, and colorings. Enjoy Momomo chilled, on-the-rocks, or made into sorbet. Copyright © SENGETSU SHUZO CO.,LTD.